As temperatures drop and snow falls, it is time to start thinking differently about how we care for lambs. 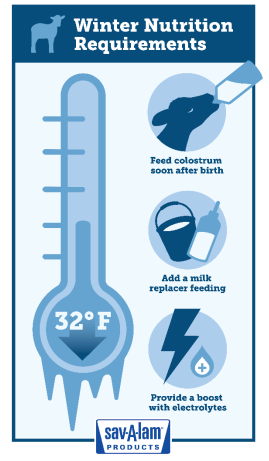 For sheep raisers in cold climates, winter is a time to take special precautions to ensure lambs grow healthy and strong. House lambs in a well-ventilated structure free of direct drafts. Ventilation is important to keep lambs healthy and prevent illnesses like pneumonia. Fresh air reduces moisture, animal odor and gasses that can cause respiratory problems by diluting the barn air contaminants. Consider opening windows, fans and inlets around the ceiling perimeter to allow fresh, cold air from the outside to mix with warm air before it reaches the lambs. You can also warm lambs by placing them in a warming box until their temperature reaches 101 degrees Fahrenheit. A warming box is a confined space to keep lambs warm and dry – it can either be purchased or homemade. A homemade warming box can be as simple as hair dryers blowing into dog crates or an insulated cooler with hot water bottles. Warming boxes are designed to provide constant, gentle heat rather than direct heat, which can cause overheating or hyperthermia (above normal body temperature). Make sure to clean and sanitize the warming box regularly. “Keep ewes close to lambing indoors to ensure they give birth in a dry, clean and draft-free environment,” recommends Olson. Use warming lamps as an aid to dry off lambs. However, use lamps in moderation since overuse may lead to respiratory problems. Also, keep heat lamps away from hay, straw and excessive dust to help prevent fire. For more information about raising lambs, visit savalam.com, like My Farm Journey on Facebook and follow us on Instagram.